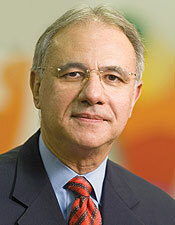 Dr. Amid I. Ismail is Professor and Dean at the Kornberg School of Dentistry, Temple University. He is a diplomate of the American Board of Dental Pubic Health. His expertise is in the field of caries prevention, outcomes assessment, design and planning for complex statistical analyses, survey methods and organizational management. He has received awards from the International Association for Dental Research (H. Trendley Dean Award), the Regents of the University of Michigan (Community Service), American Dental Association and community organizations.